OMEGALUX™ CIR series High Watt Density cartridge heaters are manufactured to the highest industry standards using only premium materials. CIR Incoloy sheathed cartridge heaters can operate at working temperatures up to 760ºC (1400ºF) with sheath temperatures up to 870ºC (1600ºF). They have excellent corrosion resistance and are especially well suited for use in applications involving molds, dies, platens, hot plates, and sealing operations. 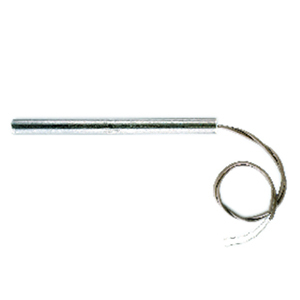 Note: CIR Series cartridge heaters use high temperature mica Fiberglas® insulated stranded lead wire (up to 450ºC [842ºF]). Standard length 14"